At the heart of the film, though, is a great performance by Phillip Seymour Hoffman as the diminutive novelist who followed his instincts to a small Kansas town to investigate the murder of the Clutters, a family of four, execution style, in their own home. The way he insinuated himself into their landscape was nothing less than audacious, especially for a flamboyant New York homosexual. Hoffman won the Academy Award as Best Actor for this beautiful, studied performance. He portrays Truman Capote as the consummate artist searching for the heart of the story and finding it in the person of the primary killer, Perry Smith, portrayed with restrained power by Clifton Collins, Jr. The relationship that develops between this unlikely pair is pinned on the fact that both of them had difficult childhoods. 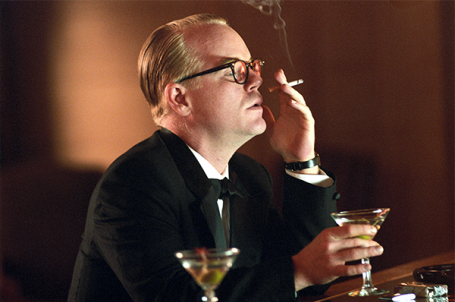 Capote lies repeatedly to Perry to get the answers he needs. The heart of In Cold Blood resides with Perry’s unpredictable rampage that turned a robbery gone wrong into a heartless mass killing. The novelist takes his time to slowly lead Perry to tell the story until time runs out and he must manipulate the killer into telling how everything went down that night at the farmhouse. A number of subordinate performances are also of extremely high quality, including Catherine Keener as Capote’s research assistant and brilliant novelist in her own right Harper Lee (To Kill A Mockingbird) and Chris Cooper as the officer in charge of the investigation. I urge anyone interested in either filmmaking or the art of the novel to see this movie. It is truly brilliant. Thank you very much! I hope you enjoy the reviews!